This article ran in our latest Spring 2012 newsletter. We made an editing error to one paragraph about the Selborne School (aka Bates School). The corrected paragraph is included in this version. Have you noticed a celebratory air in the vicinity of Grand, Elm and Belle of late? Last year, Trinity Community Church (1675 Grand Ave), a Pentecostal congregation, observed its 80th anniversary and 2012 marks the church’s 40th year of residence. The anniversary was themed “A Voice of Grace and Truth” honoring Trinity’s 1931 beginning as a home Bible study group led by Edith Erickson that led to the church’s establishment in 1937 and affiliation with the Assemblies of God in 1942. Also, the Marin Tennis Club (995 Belle Avenue) will be honoring its forty years on the courts this year, making it a clean sweep among the institutions that purchased their properties from the Marist Society of California in 1970. Congratulations to each of our cherished neighbors and best wishes to them in coming years in the Dominican/Black Canyon neighborhood! Given the celebrations, we wondered about other former owners. Sleuthing about, we learned that the site has quite an educational and spiritual lineage having been home to two boys’ schools, a military academy and seminary or The Hitchcock School (1899), the Hitchcock Military Academy (1907), the Tamalpais School (1925) and St. Peter Chancel Seminary (1955). But it was a late 19th-century disaster that first brought developers to the area. For on Sunday, April 23, 1899, at 5am “a red glare could be seen far in the north part of the city, back of Hotel Rafael and in the neighborhood of William Lichtenberg’s residence” [201 Locust] or so reported The Marin Journal of the fire that consumed the Selborne School (aka the Bates School), established in 1888, that occupied a three-story school and dormitory built by William Babcock in 1892. The devastated principal, the Rev. Charles Hitchcock, disbanded the faculty while others – Major Rex Sherer and William Babcock – worked to rebuild the school. 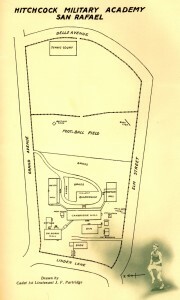 The new site was then part of the Mackay & Flood properties on Grand Avenue bordered by Elm and Belle. The school was renamed the Hitchcock School and the July 2nd San Francisco Call made assurances: “This school will reopen on August 29th with handsome new buildings, heated by steam and lighted with electricity. All buildings one story, raised well above the ground. Steam from outside. No furnace, no stoves, no flues in boys’ quarters; the nearest approach to a fireproof school.” A military department was also established. In 1908, S.H. 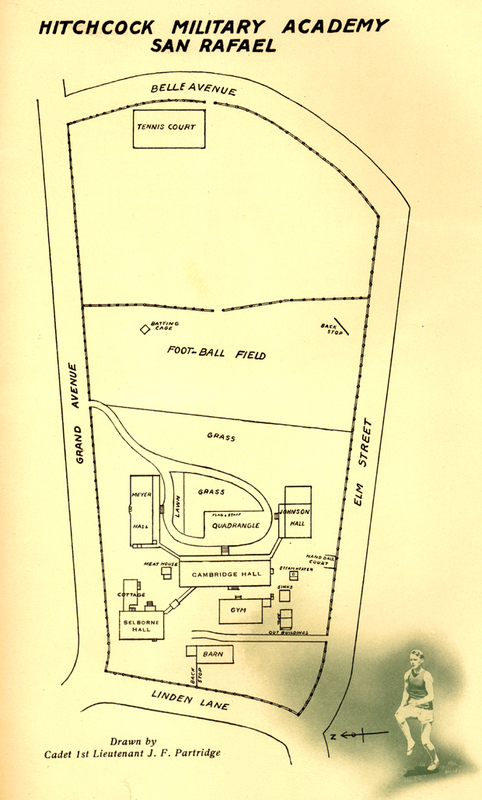 Olmstead described the Academy in The Overland Monthly as “Furnished with arms by the U. S. Government and under the instruction of an officer detailed by the department at Washington, the boys drill with the snap and precision of old veterans.” Enrollment was 110 students. Then in September 1910 fire destroyed two buildings on the campus or Selborne Hall and the gymnasium that were quickly rebuilt. A century old artifact, Hitchcock Military Academy’s 1912-1913 catalogue, is kept under lock and key at the Marin Free Library’s Anne T. Kent California Room. Perusing its pages, we discovered much about life at the academy with aspects both familiar and remote, reasoned yet odd. The school’s aim was ”to develop regular and healthy habits of mind and body.” Visitors arriving by train were met by “carriages and a public bus” and the principal sent “his carriage to meet those who will notify him beforehand”! It seemed odd to read: “All buildings are lighted by electricity.” But then we remembered that electricity had come to Marin but a decade earlier. Bathing seemed fun at “a large salt water open air bath” – surely the San Rafael baths dredged out of the canal by Charles P. Ware. Taking one last look back, you can know that Hitchcock’s cadets benefited from the daily visit of a physician to the school. When need arose the first four doctor visits were free but of course a $5.00 (not $500.00)/per term fee had already been paid. Meanwhile, the cost for tuition, board and laundry totaled $300 – $350 per term or $600 – $700 for the 1912-13 year. And that’s the way that it was … a century ago on Grand Ave between Belle and Elm!